Ascending Butterfly: Sunday, July 19, 2009 - This Week's 'Moment of Gratitude' AND Three super giveaways! Sunday, July 19, 2009 - This Week's 'Moment of Gratitude' AND Three super giveaways! On Sunday's, 'Today's Moment of Inspiration' becomes the weekly 'Moment of Gratitude'. While I do still live in Gratitude each and everyday, I decided to change this feature to a weekly to allow a 'full week' of Inspirational messages and breathing meditations. 'Today's Butterfly' will remain a daily and will post with the Today's Inspiration Monday through Saturday, and will post with the Weekly Gratitude on Sunday's. 1) As I mentioned in yesterday's post, my day out in nature resulted in a nasty allergic reaction to a bug bite. My doctor wasn't in the office and my arm was swelling like a baseball where the bite was. I was dreading a day and possible night sitting in an E.R. and being exposed to who knows what while I was waiting. Needless to say I panicked, and my mom suggested visiting the pharmacist, his help saved the day! So thanks to my mom (we are never old enough to outgrow mom's help! Everyone call their mom today and say Thank You!) and my pharmacist, I can actually type without being in agony each keystroke! Please readers, remember to use both sunscreen and bug repellant while outdoors! And if anyone finds themselves in the same situation, Benadryl and Hydrocortisone really work wonders! 2) For taking some time out for myself, while not every nice thing I tried to do for myself turned out the way I expected, I most certainly created memories this weekend! I finally took time to cut my hair, my ends were beyond frayed and now my head feels lighter from way less weight! Pics will be coming soon, but let's just say no one needed a picture of me this weekend, LOL! I hope you followed your Ascending Butterfly Homework from Friday and took time to put the work week behind and do something special for yourself! 3) For our wonderful Sponsors who are helping Ascending Butterfly to expand our offerings to you! And of course to each and every one of you who make Ascending Butterfly a part of your day. You can follow us on Twitter by pressing on the bird on the upper right of the page! You can also add this blog to your Technorati favorites in one click also! YAY And there is a digg button on the upper left of every post, 'digg' us because we certainly digg you! NOTE: We had extended the deadline and the Tres Sleek Giveaway ends TONIGHT, Sunday, July 19, 2009 - 11:59 pm EST. Get your entries in ASAP. The winners will be notified on Monday, July 20, 2009 and will have two days to respond. Make sure your winning notice doesn't get inadvertently sent to your junk mail! The subject line will read "Congratulations! You have been selected as Ascending Butterfly's Tres Sleek Giveaway Winner!". Once BOTH winners have confirmed, their (user) names will be posted on BOTH the homepage and the contest page. Good Luck Everyone! 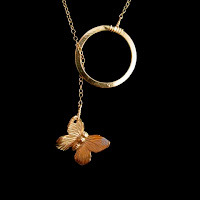 Remember, the Emily Elizabeth Butterfly Kisses Lariat Necklace Giveaway runs until July 30, 2009 so if you haven't already done so, be sure to put in your entry today. Stay tuned there is a surprise coming up soon, details to follow!